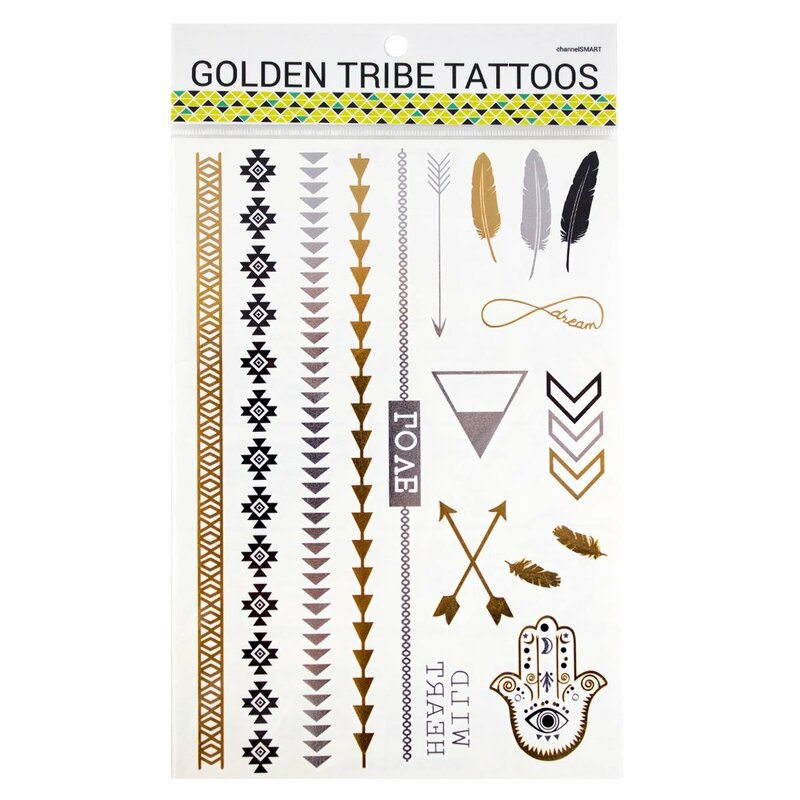 I just got these great metallic flash jewelry tattoos from Golden Tribe Tattoos. This is a big trend I’ve noticed. I see a lot of ladies wearing those out and about. I always thought temporary tattoos were for kids but with the quality and design of these it really looks great on adults too. They are great for a fun, different, and young at heart kind of look. They work just like the tattoos you get for your kiddos. Clean the area, apply the tattoo, and hold a wet sponge or clothe on the back until it transfers onto the skin. All the designs are gold and silver and very classic looking. They really catch the eye once one the skin. It comes with six sheets of designs which gives you a large selection of looks. They have a lot that look like jewelry which is a lot of fun. I loved the tribal look and feel of the designs. These would be fun to do if you had a big group of gal pals for a night out just to have fun and try something different. You could help each other putting them on and then have fun looking fabulous. EASY TO APPLY and made of non-toxic materials – last 2-5 days. Spice up your look anywhere, from the beach to the pool to your next date night. Your stylish bracelets, necklaces, and egyptian inspired tattoos will be sure to impress. INSTANTLY LOOK AND FEEL LIKE A CELEBRITY with these shimmering popular 2015 designs. Plan for your next girls night out by ordering these realistic metal gold and sliver tats. Forget the long process of applying diy henna hawaiian styles and transform your look within 30 seconds with these awesome golden tribe tattoos. FASHIONABLE AND BEAUTIFUL- Enhance your summer-fun look anytime day or night by adding a little classy fashion flair to your body. Stylish, and trendy Jewelry tattoos include hundreds of unique triangle, square, and circle patterns. Apply on your face, neck, upper back, lower back, wrist, forearm, thigh, calf, feet, hand, bicep, tricep, back of ear, shoulder, hip, arms. PERFECT FLASHY ACCESSORIES – Go to the beach or pool party in style! Accessorize without clunky jewelry and give yourself that extra little something to make you look just perfect for any occasion. These womens tattoos are sure to glitter and shine in the sun. Great for ladies, adults, and kids. Look amazing and stand out with these hot trendy fashions. Order Now!